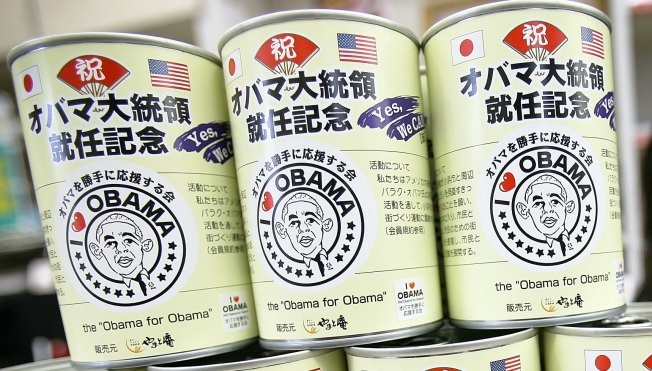 What would Warhol have made of these Japanese Obama soup cans? The Obama Administration has something of a problem on its hands. It's a problem most politicians would envy, but a real dilemma for a sitting President. People like him too much. They are willing to buy almost anything with Obama's mug on it. From underwear to action figures to ice cream ("Yes Pecan") to soap to coffee to clever Swedish furniture to — maybe the hardest sell of all these days — newspapers. So what's an erstwhile POTUS to do? Understandably, Michelle Obama has spoken out against Beanie Babies named after the couple's daughters. And the White House is looking into ways to stanch the tide of ridiculousness and protect Brand Obama while not putting a damper on people's enthusiasm. A tough tight rope to walk, considering that, while some of this is exploitive in ways that would shame even Milo Minderbender, the response from the public and supporters is overwhelmingly positive and a result of the way the campaign mobilized its base. Most products treat him more as a rock star than a politician. Take, for example, Six Point Brewery's "Hop Obama" craft ale (made from five different malts, and three varieties of hops) . The Red Hook-based brewery said the beer was not an outright endorsement, but when bars like Pacific Standard in Park Slope stocked the ale, it donated a dollar to the Obama campaign for every one sold. Everybody wins. Now if Pepsi would just do the same for their shameless rip-off homage, the reelection campaign would be set.